In America, twice baked cookies are known as Biscotti. 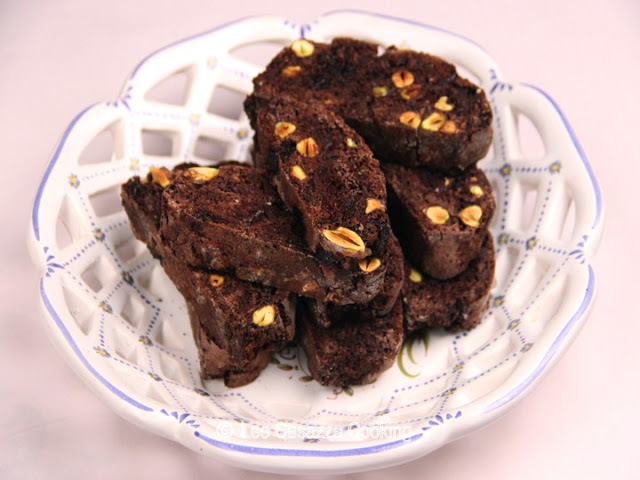 The word biscotti comes from the Latin word biscoctus, meaning twice baked or cooked. Biscotti made with a fat, such as butter or oil, will have a softer texture and shorter shelf life. These are made without butter or oil. In Italy biscotti are called cantucci or cantuccini. In a mixer fitted with a paddle, beat the eggs, sugar, and vanilla extract until light and fluffy. In a separate bowl, whisk together the cocoa powder, espresso powder, flour, baking powder, baking soda, and salt. Slowly add the dry ingredients to the mixer, while it is running. Shape dough with lightly floured hands into 2 logs of 8 by 3 inches. Place on a lightly oiled baking sheet and bake for 30 minutes. Slice into ½ inch slices and lay on sides. Reduce oven to 300 degrees F and bake for 12 minutes. Carefully flip them over and bake another 12 minutes.